While women have established daily beauty routines and use multiple products every day to look their best, they are also very open to trying new products that could make them look and feel better. As part of the POPSUGAR Insights Q2 2014 beauty study, we asked women to tell us how likely they are to try a new beauty brand. 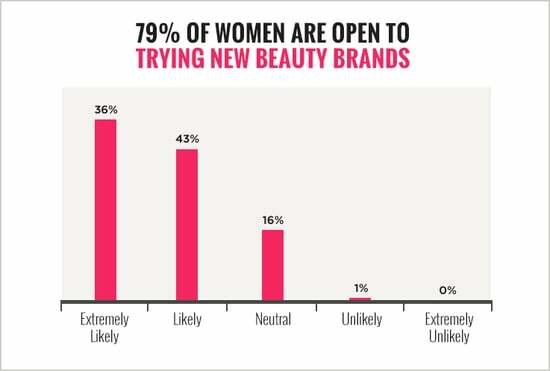 Overall, 79% of women are open to trying new brands, with 36% of women saying they are extremely likely, and 43% indicating that they are likely to try new brands. Only 1% of women said that they are unlikely to try new brands, so marketers always have an opportunity to get women to shift their loyalties.